Nouvellement construit et entièrement meublé 3 Chalet de chambre (2013) à louer. Deux lits queen, lit jumeau matelas de la couchette, plus une forme de L canapé avec dépliable reine de matelas. 7 personnes maximum. Grande chambre offre une vue panoramique sur le lac, du sol au plafond fenêtres mettre en évidence le plafond cathédrale de pin. Cheminée et mural 42 moniteur "Terminer la chambre. Face sud-ouest sur le magnifique lac Bobs le chalet reçoit beaucoup de lumière naturelle pour bronzer et se détendre couchers de soleil sur les quais. Terrasse en cèdre Entièrement meublé avec barbecue au propane, des boissons réfrigérateur, deux foyers extérieurs (bois fourni) de la table de pique-nique au bord du lac et de Muskoka / chaises Adirondack tous les ajouter à l'ambiance. Bobs lac est célèbre pour ses nombreuses baies, d'îles et de lacs de raccordement, et est internationalement reconnu pour offrir quelques-uns des «plus grande pêche du monde". A l'intérieur d'une cuisine moderne bien équipée avec: coin repas, plaques électriques, réfrigérateur, lave-vaisselle, cafetière, grille-pain et de fournir des équipements complets avec salle de bains moderne et une grande douche. Après avoir profité de votre café du matin lac et feu de joie en soirée sous les étoiles, vous saurez que vous êtes arrivé dans la région des chalets. Amarrage à 5 minutes en bas de la route. 50 minutes au nord de Kingston, à 1. 5 heures d'Ottawa ou de la frontière américaine. 15 minutes de l'épicerie et de la clinique de santé dans Sharbot Lake. 35 minutes de Perth. Disponible à la location sur mai. A wonderful, quiet getaway. Cottage is immaculate, comfortable and well-stocked. The property is very private, with nice gardens and a wonderful view over a bay on the lake. Our family with two teens and a dog had a great time with the kayaks/canoe, enjoying the many relaxing sitting areas, watching the wildlife, reading, watching movies, driving out to nearby towns, etc. A fantastic, relaxing place for a week away from it all. We had a wonderful stay at the Spence cottage! Everything was very clean and well maintained. The cool breeze that comes through the house is refreshing and keeps it at a comfortable temperature inside. The kitchen was well equipped and the rooms were comfy to sleep in. We really liked the walk in shower in the bathroom too. The view of the lake from the tall cathedral windows was beautiful and the deck had a lot of room to sit and take in the beauty of nature. We enjoyed the kayaks and fishing spots on the lake as well. From the time we booked online, Ian and Shelley were very helpful with information we needed about boat rentals and general information about the lake and surrounding towns. All in all we had a great, relaxing time at the cottage and will definitely be back! This is our second year in a row staying at this home on Bobs Lake. This place does not disappoint. The owners have always been great to work with and the house is always clean and in excellent condition when we arrive. 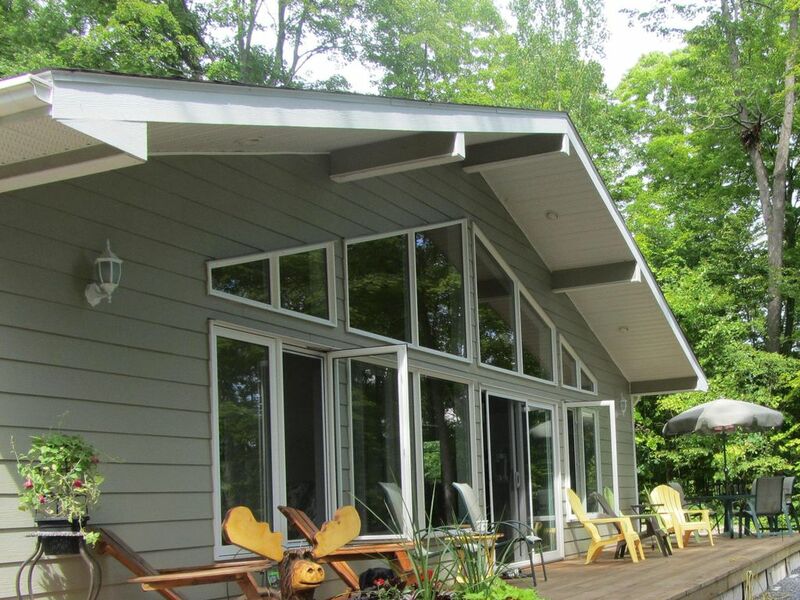 This place has everything you need to make a memorable Bobs Lake vacation. Thank you again for sharing your home with us, I highly recommend this home! Our family of four had a great week at the Spence cottage! We were pleasantly surprised when we arrived and saw just how private it was. There was tons of space outside for the kids (and dog) to run around. The kayaks were a lot of fun and easy enough for our ten year old to use without the fear of tipping. The cottage itself was immaculate and very well equipped. All we had to bring were sheets and towels.There was also plenty to do on our rainy day with a great assortment of games and DVDS. The Spence's were always quick to respond to my questions before, during, and even after our stay (when we realized we had left behind baseball gloves). We would definitely rent from them again! This home was a wonderful return the lake for us. We have been staying at camps along the lake for years and this tops everything! The house was spotless and the landscaping was beautiful. Everything was picture perfect. We cannot wait to return! The "cottage" and property exceeded our expectations. The lake traffic was minimal even for a long weekend. Highly recommended. Will rent again.